MTech Ballistic Push Dagger Black And Green | BUDK.com - Knives & Swords At The Lowest Prices! This new push dagger from MTech features a double-edged stainless steel blade with a non-reflective black finish. The 5mm-thick steel is rock solid, and the bright green rubberized handle provides a secure, non-slip grip. The 3.7" blade is ideal for covert personal protection. It includes a nylon sheath with a stainless steel clip. Dollar for Dollar you cannot find a better value on a knife! Anywhere! Solid built and shaped to hold a fine edge. Since you are not going to have to block and parry the thick stainless steel will serve you well for maintenance and ease of sharpening. The handle is high quality. If your like me you like to hold your push blades between the fore and middle finger, instead of middle and ring, No problem, reshape the handle with a knife and file. Makes you start questioning the price of some of the bigger names and their price tags. Kudos to BUDK and MTech. 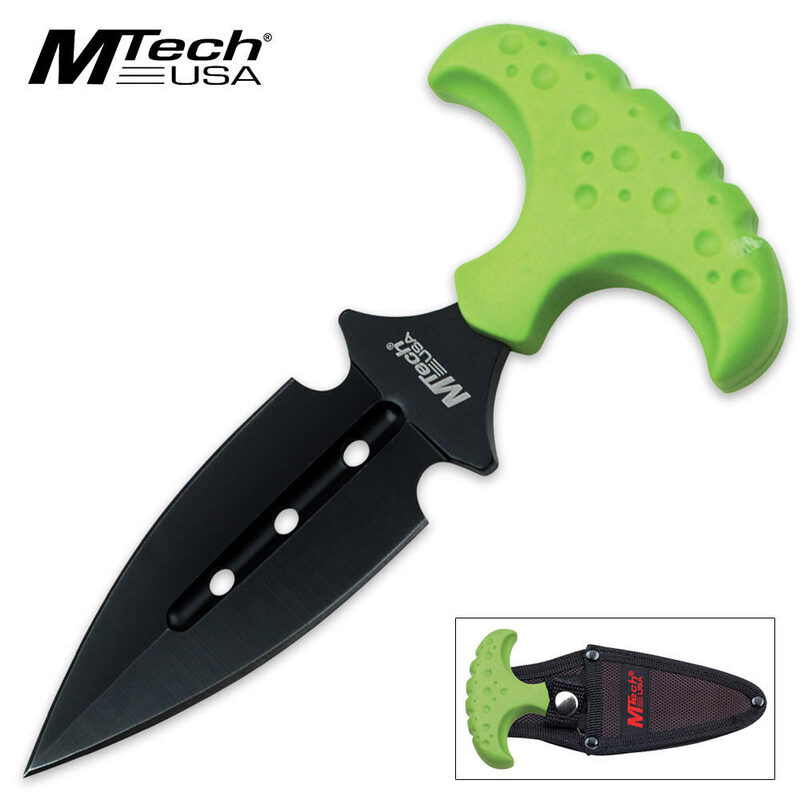 I really like this push dagger from M-Tech for personal protection. It is stout! Nice thick sharp steel. The handle fits well in the hand. Decent sheath. You can carry it in several different areas on your person. If you are looking for a quality inexpensive push dagger, look no further. I highly recommend this blade. Thanks BUDK.